Quantum mechanics governs what goes on at mind-bogglingly small scales. So far it’s provided a really good description of microscopic systems that we’ve been able to test on earth, but today’s authors muse that it’s not really had any competition – “all theories benefit from having an alternative to serve as a foil”. Since quantum laws should work on all scales, why not zoom all the way out and use the increasingly precise measurements we have on cosmological scales to test our quantum framework? In order to do this we need something to describe the relationship between the unfathomably large and the unimaginably small, and luckily, the leading theory of the early universe connects the two – that theory is inflation. Inflation is a mechanism that predicts how teeny tiny fluctuations in the early universe could lead to all of the structure that we see today, like planets, stars, galaxies and black holes. See figure 1 for a graphical depiction of the entire evolution of the Universe! Imagine blowing up a small empty box so that it’s a billion times its original size – no matter how big it ends up, it’d still be empty. Now think about filling that small box with some particles that are pretty evenly distributed, but with a few clumps and a few voids. If we blow that box up again, now the patches that had lots of particles in are going to become really large regions that are much denser than the average, while emptier patches are going to become large regions that are a lot less dense than the average. This is what happens during inflation: quantum uncertainties create microscopic differences in density that are then blown up to macroscopic scale. We’re not entirely sure what particles were around during the very very early universe (we’re talking well within the first second here), so we call them inflatons. There could be just one type of inflaton, or there could be many different types. However many there are, these inflatons will decay into the normal matter that we see today after inflation has finished. Dense regions will then undergo gravitational collapse and form black holes, galaxies and stars, whilst less dense regions will carry on getting emptier and emptier. In this way, inflation connects the smallest scales governed by quantum mechanics with the largest cosmological scales that we can measure today. Today’s authors argue that we may be able to harness all of the recent advances in cosmological observations to put a particular deviation from quantum mechanics to the test. Figure 1: This image depicts how the Universe evolved from inflation on the far left, through to structure formation and the galaxies and stars that we see today. Image credit: NASA. One way of measuring the overdense and underdense regions left behind after inflation is with the primordial power spectrum. This spectrum tells us how many overdense regions there were of a particular size immediately after inflation. In particular, the larger the amplitude at a particular scale, the more overdense regions there were of that size. For example, in figure 2 is a picture of a simple power spectrum with arbitrary units. 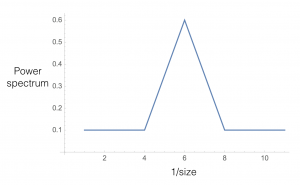 The peak shows that there is more power in regions with wavenumber 6, so regions of size 1/6 must have been more dense than regions with wavenumber 2 or 3 for example. Everywhere besides the peak is flat, meaning that the regions of these sizes all had similar densities. The amplitude of the power spectrum is decided (in part) by the size of the quantum fluctuations, and hence if we can measure the primordial power spectrum using things like the Cosmic Microwave Background we’ll be able to learn something about how large those initial quantum fluctuations were, and how they were distributed. Check out this astrobite for more background (ha) on measuring the power spectrum using the CMB. Figure 2: A simple power spectrum with arbitrary units. The peak shows that there is more power in regions with wavenumber 6, so regions of size 1/6 must have been more dense than regions with wavenumber 2 or 3 for example. For the simplest model of inflation we know about, the power spectrum should be almost flat across all scales, with a slight tilt downwards. This means that there were slightly more large regions that were overdense than small regions, but on the whole, everything looks pretty much like the average. The Planck satellite was able to measure the primordial power spectrum on large scales and found that the data agreed with this slight downward tilt, and that the amplitude of the power spectrum is around . Today’s authors introduce a deviation to the standard picture of quantum mechanics by including some extra and more complicated terms in the Schrödinger equation. For this modification, there are different predictions for the power spectrum. Since the data from Planck tells us we need the slight downward tilt in the power spectrum on large scales, a very strong constraint must be placed on the extra terms in the Schrödinger equation in order to fit with the data. Comparing this constraint with the one from terrestrial experiments shows an improvement of 15 orders of magnitude on this particular term in the theory, showing that Cosmology can help us to distinguish between quantum theories. 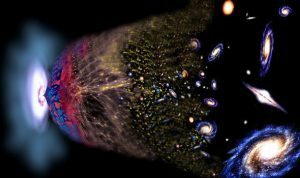 Cosmological observations have gotten so good now that we are able to use measurements on the largest scales to test our theories on the smallest scales. Inflation is the key theory that unites our understanding of how tiny features became the biggest structures we see in the Universe today, and the afterglow of this process is seen in the primordial power spectrum. Being able to constrain this spectrum with cosmological data allows us to test our quantum ideas, and today’s authors demonstrate this “not to challenge quantum mechanics, but to celebrate modern cosmology”.